﻿The stove train starting up from the terminal at Nakasato Station. The attached plow is used to clear snow from the tracks. A continuous bluster rips snow from the white ground all around us and keeps sending it flying into our faces, as we stand on the platform of Kanagi Station in Goshogawara. It is frigid weather and I am relieved when I finally spot our train emerge out of the bleached hazy distance. Two identical orange train cars — named Hashire Merosu, the title of a short story by famous Japanese writer Osamu Dazai who grew up in these parts — arrive simultaneously at two adjacent platforms headed in opposite directions. But the one on our side is different. It is pulling a black, antique car behind it. A conductor working for the Tsugaru Railway guiding passengers off the stove train at Kanagi Station. This is the so-called “stove train,” a diesel powered vehicle we have come all this way north, into the frozen hinterlands of Aomori Prefecture, just to ride. A conductor on the platform ushers us on board, along with around two dozen other passengers. I show him my ticket, a thick cardboard stub reminiscent of old school movie tickets and nothing like the cheap paper slips we use to get into stations in Tokyo. On each side of the aisle is a row of four-seat booths with tables attached. These rows are interrupted by two stoves, one on the left side about a third of the way from the front of the car, and one on the right side a third of the way from the back. They are coal-powered cast iron affairs with roundish, somewhat bloated frames. Traditionally they are called “Daruma stoves” because their portly shapes are said to resemble Daruma dolls, an iconic Japanese character originally modeled after the posture of the Zen patriarch Bodhidharuma while seated in meditation. A grill rests on top of each stove and a chimney rises from each stove through the roof. The train starts up and once all the passengers are settled, the conductors begin taking turns cooking the food we have brought with us. Snacks such as rice cakes and rice balls can be grilled here, but the most popular treat is dried surume squid, caught in the oceans around Aomori. The conductors take strips of this squid into their white-gloved hands and put them on the grill. It doesn’t take long for the great heat from the stove to lightly sear the thin meat and, as soon as it is ready to eat, the attendants heap it on a top of the plastic bag it came in and place it on the table in front of the passengers. 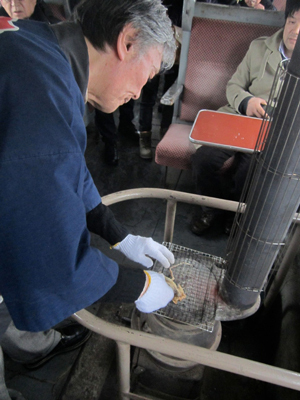 A conductor on board the train moves quickly to cook dried surume squid on the grill of the dharma stove. With stoves on both sides of the train, the interior is toasty warm. In fact, it is perhaps a bit too warm directly beside the stoves as those seats remain empty. 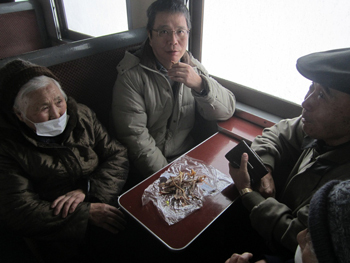 The passengers munch on their squid and other snacks, some of them drinking locally brewed sake. They are in a jovial mood, despite the bleak snowy fields that surround us. Many who boarded along with us at Kanagi Station have just come from Osamu Dazai’s house, a fine example of Meiji Era architecture that has been preserved for 107 years and is now a museum dedicated to the writer. One group has come from Hawaii and we get to talking. I tell them that they are brave for coming to such a cold place from such a warm one, but they say they are glad to be here, as Aomori has much to offer, including many winter sports. Other groups have come from various places in Japan, including one family from another region in Aomori. Now and again the conductors bend down to stoke the fire. Opening the solid metal door of the daruma stove, they scoop some black coals from a bucket with a shovel and dump it on top of the red hot coals inside. Their movements, whether grilling the squid or fueling the fire, are quick and efficient. It turns out that the female conductor spent some time studying abroad in Hawaii, and she begins to chat with the Hawaiian tourists in English. She entertains the other guests in Japanese and Tsugaru-ben, the dialect of this region. She then begins to point out some of the local landmarks, of which there are few in this rural landscape of endless white. One is the tiny red building of Togawa Station, which she refers to as megoi, a Tsugaru-ben term that means tiny and adorable. One of the Hawaiian tourists says it looks like an outhouse, and the car erupts in laughter. A group of Japanese tourists from Aomori on board the stove train. The stove train runs along the Tsugaru Railway, the most northerly train line on the island of Honshu. Stretching some twelve kilometers, this twelve-station track was completed in 1930, meaning the stove train has been in operation for more than 80 years. However, it stopped briefly during WWII due to supply shortages and has been replaced several times. The current model is its fourth incarnation and the third, which was constructed partially out of materials salvaged from the original, can be seen at the Railway Museum, in Saitama Prefecture. Traveling the entire Tsugaru train line takes approximately one hour, but since we boarded at Kanagi Station, which is in the middle of the line, we reach the terminal, Nakasato Station, in about thirty minutes. We step out onto the chilly platform, but the stoves and the freshly cooked food has warmed us to the core, so it doesn’t seem nearly as bad as when we got on. 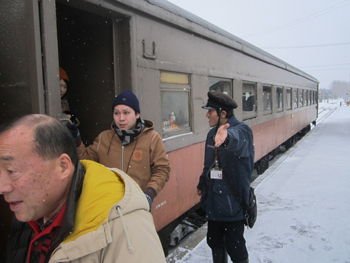 Some of the passengers take pictures with the train in the background and the rest of us watch as the station workers attach a special train car with a plow attached to the front. The train will now return the way we have come and clean the tracks of snow, which keeps falling steadily around us. 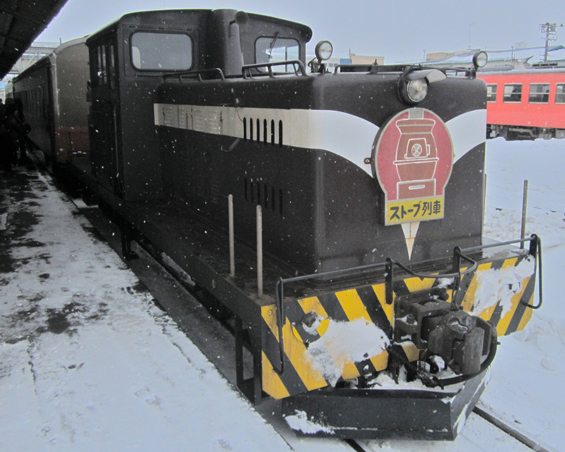 Tsugaru Railway is approximately one hour by car from Aomori City and the stove train runs throughout the winter. Visitors to the area can also take a tour of the Dazai Osamu Memorial Hall near Kanagi Station or enjoy a special chicken and vegetable soup called tsutetsujiru just outside Nakasato Station.